The Wire Belt Company of America is rooted in the great American tradition of invention, enterprise, and commitment to quality. Back in the early 1900s’ (1902-1911), Jesse Wade Greer was selling candy from his grocery store in Mt. Pleasant, Texas. It was there that his talent for innovation first surfaced. He created a process for coating candy that was later to grow into other patents, and ultimately, a small industry. By the 1920s, Jesse was manufacturing candy-making equipment in Cambridge, Massachusetts. Chocolate coaters, cooling conveyors, chocolate melting, tempering kettles, and of course, the famous, patented Greer Chocolate Coater. The conveyor belt on the Greer Coater became known as the Greer Belt. And in 1947 the belting division was spun off as Wire Belt Company of America. Wire Belt Company is a global company with manufacturing facilities in the United States, United Kingdom, and Germany. The company is devoted to manufacturing hygienic, safe, and efficient conveyor belts and conveying solutions. Their mission is to lead the way, continuously improving the industries standards. The Wire Belt front office moved up from Winchester, MA in 1989 and production started in Londonderry in April 1990. Wire Belt Company of America’s facility is located at 154 Harvey Road, in Londonderry. Contact them at (603) 644-2500. 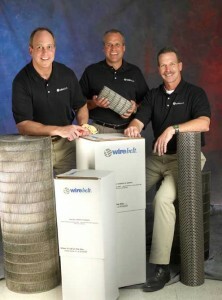 For further information on this local company with a 99.93% on time shipping record visit the wirebelt website.